If you show up to my parent’s lake house for lunch any day of the summer, this Spicy Black Bean Salad will inevitably be on the table. It always has been. And I think I finally know why. 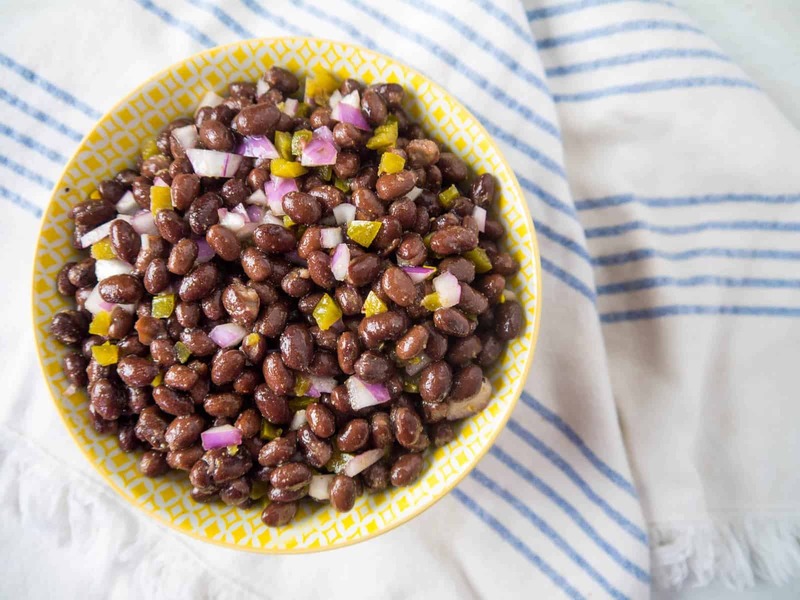 This Spicy Black Bean Salad is wildly easy and made up of mostly pantry ingredients—perfect to whip up when you don’t have quick access to a grocery store and when people are just “popping over”. Popping over for a coffee/lunch/dessert/snack/chat feels like a lost art. I mean really, when does it even happen anymore? In the world of cell phones and crazed calendars, when was the last time you ever had someone stop over to your place unannounced? I don’t think I’ve ever had that happen in my adult life. But at my parent’s house in Lake George, that seems to happen all. the. time. Cell phones aren’t particularly reliable there, and the combination of a casual summertime vibe and being surrounded by lifetime friends and neighbors seems to make this a common occurrence. And you know what? I love it and I would love to make a comeback for “popping over”. It feels quaint (just the phrase sounds like it came out of my Grandma’s mouth) and it’s so fun to drop whatever you’re doing to be with people you love. And lazy… it feels indulgently lazy to drop what you’re doing and just kick back with a lemonade, chat and be a hostess for a bit. So for my mom, being able to quickly put something on the table that felt a bit more prepared and put together next to the usual scattering of cold cuts, cheese and crackers, hummus, chips and/or cookies was awesome. So quickly, this Spicy Black Bean Salad became a staple of our summer fridge. But even if you’re not having anyone pop over anytime soon (I’m 99% sure I’m not! 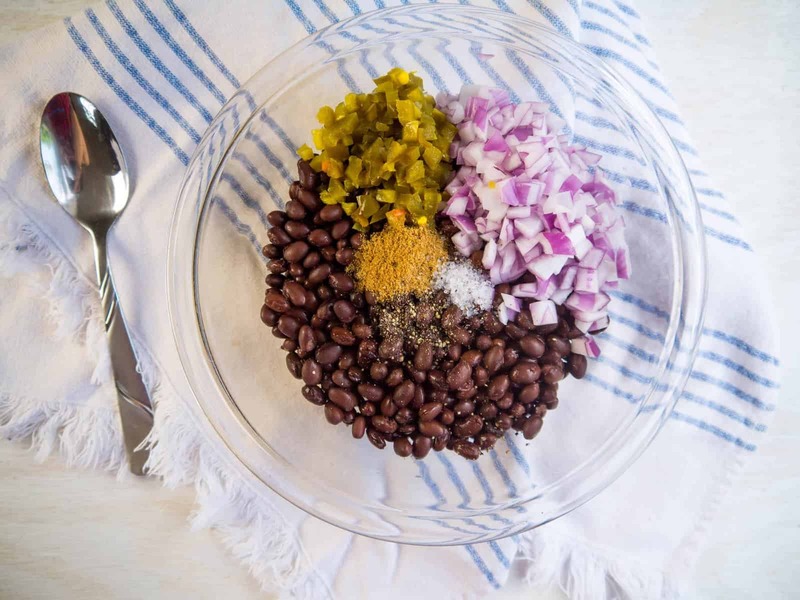 ), this Spicy Black Bean Salad will become an instant hit! 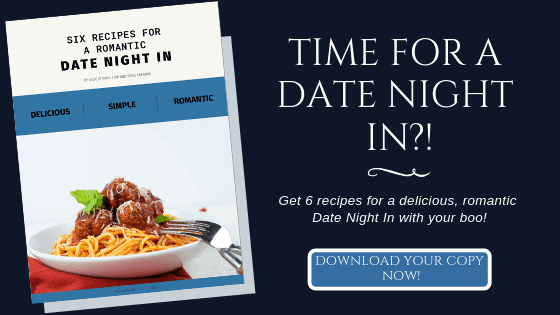 It’s super quick to whip up, requires simple ingredients, tastes delicious, and keeps well in the fridge for up to a week! I love making a batch to eat as a side to grilled dinners or lunch sandwiches, to toss on taco salads or in a tortilla for a quick quesadilla. Cover with plastic wraps and refrigerate for 1 hour or more. Serve it cold as a side to a grilled dinner or picnic sandwiches.